OXFORD, Miss. 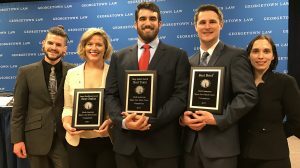 – The University of Mississippi Space Law Moot Court Team won big at the Manfred Lachs Space Law Moot Court Competition-North American Region, bringing home three awards and advancing to the world championships. The competition, conducted March 31-April 1 at Georgetown University Law Center in Washington, D.C., featured 16 teams and was divided into two divisions of eight teams each. The Ole Miss team consisted of second-year students Kent Aledenderfer of Huntsville, Alabama, and Kyle Hansen of Issaquah, Washington, and third-year student Alexia Boggs, from Nashville, Tennessee. Andrea Harrington, the school’s air and space law instructor, served as faculty adviser and third-year student Marshall McKellar, of Hattiesburg, was the team’s student coach. Each team submitted written briefs for both applicant and respondent positions and had an opportunity to compete on both sides in the preliminary rounds. Scoring in the preliminary rounds consisted of 50 percent briefing scores and 50 percent oral scores, and the result determined rankings going into the tournament-style rounds. The UM team earned the highest score overall in the preliminaries and was ranked first in Division A. As the tournament progressed, the team competed in the quarterfinals against fourth-ranked University of Arkansas at Little Rock. Ole Miss then advanced to the semifinals, competing as the respondent against McGill University in a tight round. The team then progressed to the final round, arguing as the applicant against the University of Nebraska. UM earned three major awards: team awards for Best Brief and Best Team, and Boggs received the Best Oralist award. “The competition was an amazing experience and a true team effort,” Boggs said. “For months, Kent, Kyle and I have been learning from each other and refining our skills in legal research, clear writing and oral argument. The Best Team title allows the team to compete in the international finals, set for Sept. 26-28 in Adelaide, Australia. Competing teams include the champions from Europe, Asia-Pacific and Africa. “I am very pleased that I get to continue working with this remarkable group of students in preparation for the international finals,” Harrington said.